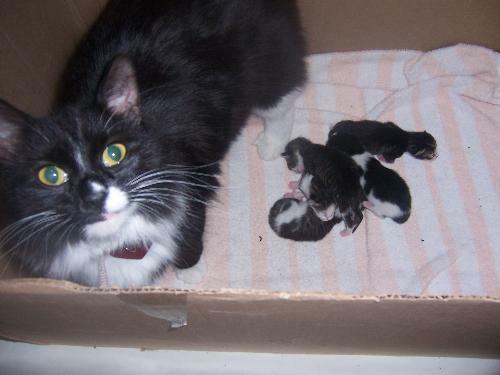 My precious kittie had her babies Sunday Morning! She mowed at my husband and would walk down the hall and when he wouldn't follow her she would come back to him and paw his leg and meow. So he went to her box with her. All in all it took two hours! She had five girls. Four are Grey and white like the dad and one is black and white like her. They are so beautiful! Congratulations to you and your cat, they look adorable in the photo. Both my cat have been done, so it's nice for me to see other peoples kittens, keep posting the photos!! Congratulations! I remember when my cat had kittens. I helped with the delivery. It was once of the best times in my life. Best of luck to you and your kitties! That is so cute i wish i could pet it. Ahhhh, they are so cute, best of luck to them all. naaawwww, how sweet, she was so proud to show your husband what she had did. Congratulations on the little sweethearts. Hooray! Good luck on the new brood. I just adore and love cats. ^^ I own a cat at home too. Her name is Kitty and she is getting fatter everyday. She's playful and she is so cute. By the way, what's the breed of your cat? Is that a persian cat? =^_^= MEOW!!! awwwww!!! Isn't it awesome when they have their babies? Haha, we should get together and share photo's hahaha. okay i know i'm nutz, i love kittens though, mine are holly i think their almost 6 weeks now, that's crazy! Congratulations! I love the picture. The kittens are going to be so cute when they get older. I had forgotten how tiny kittens were when they were born. Have fun watching them grow up and congrats again.